"...Defending a player in the low post often means denying him the ball. A good defender will play a post player closely and reach an arm out in front of the defender to try to deflect any passes to him. If the ball is below the free-throw line, you should try to be between the ball and your opponent, making a lob pass over your head the only viable option. If the lob pass is successful, you'll have a difficult time stopping your opponent from making a layup unless you get help from a teammate. Low post defenders also need to be ready to help out a teammate if there is penetration on the other side or down the middle of the lane. ..."
for their key support to the eBA Stats Websites. visiting their sites or using their services ! "Baseline Double 1-on-1" Drill from John Calipari! Calipari shows in this training video a combo drill that he uses to help his guards learn to initiate half court offense. Meanwhile, post players read the ball handler and focus on showing their body or numbers for a post entry. Once entered, posts use and develop post moves to score. The next step for this drill is to have the guards work to get an inside foot and create space between them and their defender, allowing them to get open on the wing for another post entry. Basketball Spacing & Relocation by Kelvin Sampson! 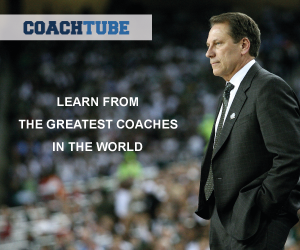 TRAINING VIDEO by Kelvin Sampson! According to Coach Sampson, there are three things you need to be successful playing in a spacing offense: a point guard that can play out of pick & roll, a sprinter (the big who sets the screen), and a 4-man that can make a three. 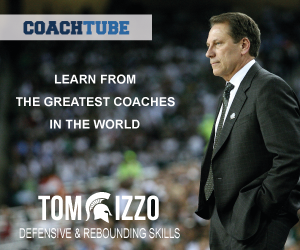 Coach Sampson show in this training video a drills that incorporate the ideas of the spacing offense. This drill works on catching the ball on the move to improve a slower athlete's ability to attack the middle with the "beat them off the catch" concept.